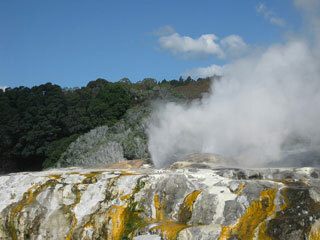 Thermal activity is at the heart of much of Rotorua's tourist appeal. Geysers and bubbling mud pools, hot thermal springs and the Buried Village (Te Wairoa)  so named after it was buried by the 1886 Mount Tarawera eruption are within easy reach of Rotorua. In Kuirau Park, to the west end of Rotorua, hot bubbling mud pools dot the park. Visitors can soak their feet in hot pools. This article uses material from the Wikipedia article "Rotorua Geothermal Area", which is released under the Creative Commons Attribution-Share-Alike 3.0 License.